The South End Grange has been shrinking faster than our old growth nettle forests, which may be a meaningful correlation … unless you’re of the mindset that thinks science is a hoax foisted on you by us radical liberals hiding here on the hedonistic head of the island. Membership keeps declining and it’s harder and harder to recruit the agrarian-minded now that the family farm has gone the way of Eisenhower Republicans and McGovern Democrats. Desperate times, of course, call for desperate measures. Who you gonna call?? The South End String Band, of course. Which is who the Grange called for its loco-ly known high powered PR Machine. When old time fiddle music seemed poised for extinction, they brought it back from the precipice, dressed it up as South End Roots Music and made fortunes on CD’s, T-shirts and memorabilia before offering shares on the Chinese stockmarket. Obviously they had the savvy to save the Grange from the dustbin of history. Following a four hour brainstorming session at the Mabana Yacht Club’s exclusive Pilot House Lounge, the Band emerged into the early afternoon sunlight with a Plan, one deceptively simple, almost painfully obvious and no doubt destined to serve as prototype for marketing strategies at the Harvard School of Bizness and the Phoenix School of mail order agricultural degrees. Cannabis. The New Pharming. The most lucrative crop in America, bigger than corn, bigger than soybeans, bigger even than medical nettle. And for the past half century, the only crop on the South End. And now … LEGAL. Welcome to the 60’s, y’all! Agriculture is King once again and the Grange and the lava lamp are both coming BACK!! 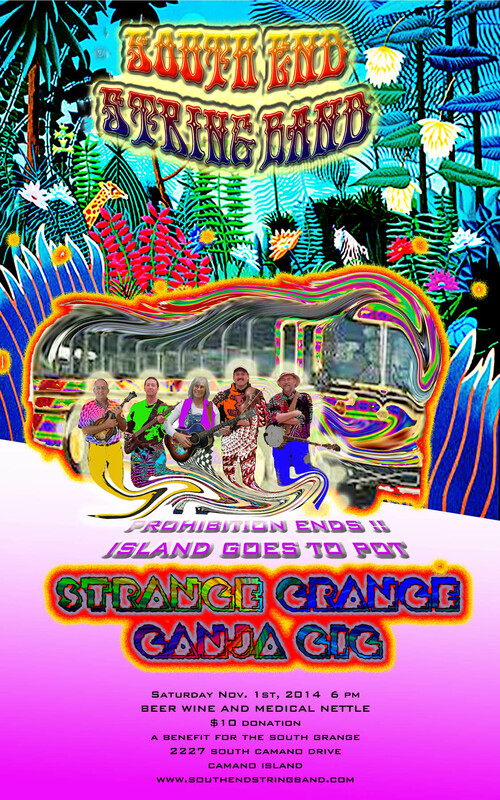 So dust off those bellbottoms, bro, unpack those tie-dyes, sister, turn on the blacklights, dude, clean up the hookahs, Alice, cause the South End String Band is playing a Strange Grange Ganja Gig Saturday, Nov. 1. Come on down and join them in a return to the Age of Aquarius. The Past was nothing but Prologue and the Present is nothing if not Psychedelic. The South End: where the 60’s met the Sound. And the Sound is the South End String Band! !